Studious followers of my OBGG events, may have noticed that I did not have a 13th game night...OBGG game nights are like New York City elevators, am I Triskaidekaphobic? No, but I couldn't think of something fun that was related to the number 13 or 14 other than pulling this trick...for lameness sakes, I know. Anywho, an unspecified number of gamers arrived, played and left. Fun was had, babies cried, snacks were consumed. While I was finishing up my last second preparations for game night, newcomer Danny showed up about an hour early. So I recruited him to help put my chairs up. Then I found out that Danny had a prior commitment at the time that game night started, so we played a quick game of Toc Toc before he took off. He said he might come back afterwards, but that didn't happen. Danny took off, and then Elden was left by his lonesome for another 1/2 hour until Jerry came to disrupt the quiet. 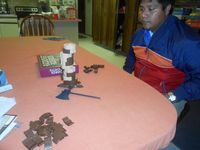 After Jerry got the tour of the house, Tim showed up and forced us to play Ricochet Robots. Mason was hanging around and likes the puzzle aspect of this game and eventually Suzie showed up and stole a chip, probably from Jerry or Tim and denied them a sole victory. Here is a puzzle to solve. 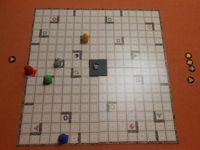 After some hemming and hawing it was decided to go with something light that all the adults could play together and with KristyLynn now arrived we had the max for Dice Town, which always seems to go well. 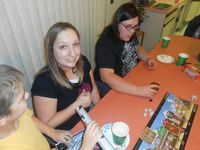 Suzie had the added benefit of Masons luck in dice rolling. Suzie pretty much dominated this game throughout, it seemed that her dice were weighted for the Queens, pulling out 4's and 5 of a kind on a routine basis and took a bunch of best hands and stole everything from everyone. Tim was able to mount a valiant attack on the last couple turns and got close and KristyLynn escaped scrutiny, and picked up the sheriff on the last turn for an additional 5 points, Elden and Jerry were just biding their time for the next game. This is a fun game that Tim brought along because I was hoping to play a Halloween game with another friend who never showed up. 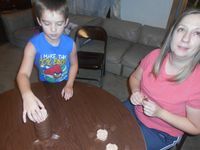 We let Mason get back in on this one, so the participants were Elden, Jerry, Suzie, Kristylynn, Mason and Tim. There was an interesting wrinkle with the transporters that put the Monster on an interesting loop, and we started right off the bat with the Monster going until he killed 2 people, and brought him straight into the middle of the action. Tim, seems to think that he forgot the Monster can only move a max of 20 spaces, which probably would have changed the game considerably, because I don't think anyone was within 20 spaces. Tim won at one point, but had forgotten the actual rules to the game and didn't realize that he won for about 20 minutes, so we kept trying to get our guys to the end for a bit longer until Tim read the rules and realized that he met the win conditions. We'll forgive him anyway. 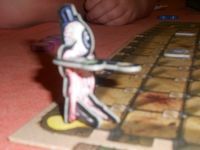 Dan showed up near the end of Fearsome Floors, so we kicked Mason out again so we could played one of Suzie's favorite games, Shadow Hunters. Kristylynn was the first to reveal as the werewolf, which made her a little less appealing to attack. At one point she took control of some cursed blade that she got to use as well, so attacking her was a crazy proposition. Tim ended up dying first as the Unknown and with no other Shadows in play the hunters needed to kill Kristylynn. At some point Jerry revealed as Allie in order to heal, and then Dan, probably not fully understanding his character decided to attack Kristylynn, maybe he was forced to when he took control of the cursed blade, I don't remember, and finished her off. Which gave the win to Elden and Suzie who were Hunters and Jerry as Allie for surviving. Dan did not win, though he mopped up the game nicely. Suzie went to put the girls to bed, and it was Dan's bedtime. 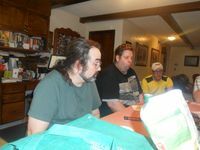 But Cory showed up and we played a game of Bohnanza. Elden ended up getting some quick coins and we played with the option of having 3rd fields only costing 2, Elden has never won with a third field but had some plans for the flexibility 3 fields offer so he took a gamble and bought the third field. In the end he ended up with 16 thalers, but Tim edged him out with 17, which didn't matter because Jerry wound up with 19. Kristylynn ended up with 13 and Cory finished with 10. 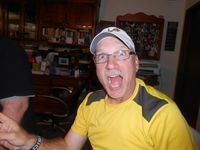 So Jerry reigned victorious. 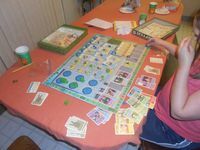 Suzie finished putting the girls to bed and Mason wanted to play something and Bohnanza was not done yet, so Mason and Suzie played three rounds of Toc Toc Woodman. Game three was a totally dominating performance from Suzie 9 to -19. After everyone else went home, Elden convinced Suzie to play a game of Copycat. Last time she smoked Elden, so it was payback time. Elden decided to not go with a super lean deck as is his general deck-builder strategy but went for points as often as possible and built up opportunities to get more cards and more campaign workers. Suzie focused on a lean deck and getting lots of money in order to afford those really expensive awesome cards and put together a couple of killer point rounds in the end. However, her aggressiveness also ended up in quite a few of the red cards which slowed her down just enough that she wasn't able to keep it close enough or make her last turn lucrative enough to overtake the lead. Elden ended with 104 and Suzie 80. Elden opted to sign the slot for his color "gold" on the record sheet.